Limoneira Co. has a 125-year legacy of bringing quality produce to the market. But this would not be possible without its team of experienced people, President and CEO Harold Edwards says. Thanks to its low turnover rate, “I’m retiring people who have worked with the company for 40 or 50 years,” he says. Based in Santa Paula, Calif., the global agribusiness raises and sells citrus fruits including lemons, oranges, avocados, star ruby grapefruits, pummelos and limes. Founders Wallace Hardison and Nathan Weston Blanchard started Limoneira in 1893, with $1 million in startup funds. “The purpose was to create the country’s first, large-scale citrus-producing company,” Edwards explains, adding that the company grew over the years through mergers and acquisitions. Today, Limoneira is the largest avocado producer in the United States, and one of the nation’s largest vertically integrated suppliers of lemons. “What started out as 400 acres of citrus production has evolved and grown into a global production company,” Edwards says. In addition to its 12,000 acres of farms in California and Arizona, Limoneira has strategic alliances in Mexico and Argentina, produces and packs lemons in Chile and has a sales operation in South Africa. “All of these combined together are the ‘one world of citrus’ operation,” he says. Limoneira’s “one world” concept, he notes, revolves around the idea of creating a steady supply of products to its customers around the world. In the past, Edwards explains, Limoneira delivered products to the market for eight to nine months. But maintaining worldwide operations are essential to being a supplier all year round. “We’re able to assure a 365-day, reliable supply chain to our customers,” he says, adding that this helps it serve clients overseas. Limoneira’s client focus has made it a leader in its industry, Edwards says. “What we’re trying to do is be very customer driven and work with the customer by being vertically integrated,” he says. The company takes the approach of bringing the requests and requirements that come from its customers all the back to its operations so it “can execute against our competition,” Edwards says. “It’s different from the old strategy that used to be deployed where it was supply side control focused. Limoneira spends the majority of its time creating solutions for its retail and foodservice clients. The latter, Edwards notes, comprise 70 percent of its work. 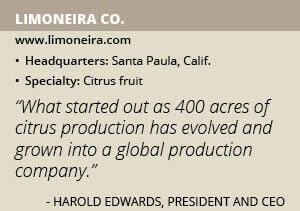 Limoneira’s recent investments also include a new, state-of-the-art packing facility in Santa Paula. “It’s right behind our old legacy packing house,” Edwards describes, adding that the location is in its second year of operation. He adds that the facility has grown Limoneira’s annual capacity from three million cartons to eight million. “It processes three times the amount of fruit with 70 percent of the amount of labor that the old packing house used to require,” he says. It also enables Limoneira to bring more quality to the end users with new technology. “It’s very gentle on the fruit, and the quality in the pack is noticeably different,” Edwards describes. The facility also freed up capacity, allowing Limoneira to put a greater focus on specialty packs that customers request, as well as look at more areas to invest for producing and sourcing lemons. “This investment has been a game changer to our company,” he says. Limoneira is enjoying positive trends in its market, Edwards says. “One thing that has happened that is fantastic for us is two of the major focal points of the company — the [lemons] and the avocados — have become super foods,” he describes. More consumers have become aware of the nutritional and health aspects of lemons and avocados. “Because of the understanding of the nutritional benefits of these two products, we’re seeing demand in these two areas increase at levels that we haven’t seen in the last 125 years,” Edwards describes. In fact, Limoneira is in the position where demand is exceeding supply. “That gives us the opportunity to create value for clients to serve their needs as they’re trying to service their customers,” he says. He notes that the company maintains a work environment that is extremely collegial. “We try to operate as a large family,” Edwards says. “Everybody is very focused and everybody has a very specific job. Its longtime employees include Chief Operating Officer Alex Teague, whose great-grandfather was the company’s first general manager in 1983. “He was one of my first hires in 2005,” Edwards says. He also highlights CFO Mark Palamountain, who was hired by Limoneira as a solar energy contractor when it made large investments in solar electricity. “He became so impressed with the company that he came and asked if he could have an opportunity with the company,” Edwards recalls. Other key members include Head of Sales John Carter, Director of Marketing John Chamberlin, Director of Human Resources Kathleen Thompson and Rosie Castillo, who manages its housing operations. “Important parts of our company’s mission include both providing shareholder value and a substantive focus on sustainability,” Edwards says. “Driving revenue in a global air-traffic control mode is Carter’s role,” he continues. “Rosie Castillo’s housing component is a key part of sustainability. Kathleen Thompson has placed a focus on employee safety and has helped the Company earn family friendly accolades. Limoneira plans to commemorate its 125th anniversary later this year. “We’re organizing a celebration event in which we’ll bring in the community, our vendors, our customers and people who are affiliated with our company,” Edwards describes. He adds that the company’s long history reflects its goal of sustainability. “The ultimate test of our brand is that we’ve been around for 125 years,” he says. Limoneira plans for more growth as it extends its history. When the company joined the NASDAQ Global Exchange and became a publicly traded firm in 2009, it chose to focus more on expansion. Both firms are working together on a 1,500-home, master-planned community in Santa Paula. Although this is not a frequent venture for Limoneira, it takes advantage “when the opportunity presents itself and it’s the right thing for the company,” he says.